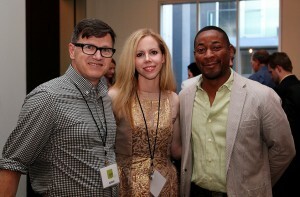 I recently attended the Preview Party for the 2012 Art Melt at the Shaw Center for the Arts in Baton Rouge, LA. My painting Survival of the Fittest was one of the works selected for the show by jurors Franklin Sirmans (Chief Curator, Los Angeles County Museum of Art); Ron Platt (Curator, Birmingham Museum of Art); and Thomas Neff (Artist and Professor of Art, LSU). 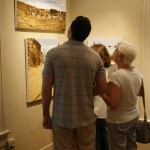 If you missed the Preview Party and the opening reception, no worries as the exhibit will be up through August 3rd. It’s a little early, considering this will take place next year, but I’m very happy to announce that my work will be in the “Myself” exhibition at the University of Nevada, Reno. 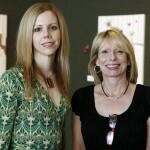 The exhibit will take place in the Sheppard Fine Arts Gallery and is curated by gallery director, Marjorie Vecchio. There will also be an exhibition catalogue featuring essays by Joy Garnett and Mira Schor. 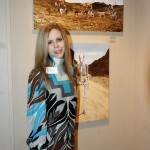 This will be the second time my work has been shown in Nevada. I came across the call for artists through Ms. Garnett’s blog and was excited to see that she would be contributing to the catalogue. I am honored to be one of the selected artists. Here is the official list: Funda Zeynep Ayguler, Marie Bergstedt, Megan Berner, Emma Bee Bernstein, Chris Carnel, Jean Marie Casbarian, Craig Cully, Megan Cump, Joe Delappe, Michael Eade, Peter Emerick, Joy Episilla, Elise Gardella, Alex Gingrow, Jen Graham, Cynthia Greig, Amy Guidry, Jen Harris, Rosi Hayes, Ahren Hertel, Amiee Hertog, Nene Humphrey, Suzanne Joelson, Josh Jordan, Jiyeaon Kim, Eunkang Koh, Kate Kretz, Larry Lee, Julie Leguin, Elizabeth Leister, Teryn Loebs, Holly Lynton, Megan Malone, Valerie Margolis, Lilly McElroy, Alan Mevis, Rob Millard-Mendez, Elizabeth Morisette, John Orth, Kathryn Pannepacker, Maria Paschalidou, Sarah Peters, Zoran Poposki, Robert Pritchard, Clifford Pun, Letitia Quesenberry, Carol Radsprecher, Erin Riley, Page Adriana Russell, Susannah Sayler, Matthew Schlagbaum, Tim Sharman, Jackie Skrzynski, John Steck Jr., Joshua Stern, Robin Tewes, Kristine Thompson, Clare Thorton, Mickayel Thurin, Christina Renfer Vogel, Deborah Wasserman, Jessica Watson, Orion Wertz, and Tammy Wofsey. The exhibit will take place at the Sheppard Fine Arts Gallery of the University of Nevada, Reno from January 18th through February 18th. There will be an opening lecture and reception on January 20, 2011. This weekend’s 2nd Saturday Artwalk for the month of September (Saturday, Sept. 11th) honors Elemore Morgan, Jr. The State of Louisiana has declared September 18th, Elemore Morgan, Jr. Day and will be commemorating this special designation with grants awarded by the Elemore Morgan, Jr. 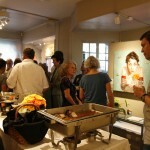 Visual Arts Endowment and a special reception during the Fall Fest event on September 11th’s Artwalk. 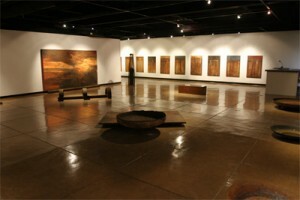 Galleries are hosting special exhibits as well. The event starts early this month- from 4-8pm. Yes, I know that titling this “Homecoming” conjures up thoughts of football and brightly colored taffeta. However, that’s not the type of homecoming I’m referring to. 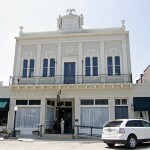 I’m exhibiting in the “Where Are They Now” exhibit at the Slidell Cultural Center at City Hall in Slidell, Louisiana. I was a student in the Talented Art Program during my junior high and high school days in St. Tammany Parish, so as an arts professional, I have been invited back to take part of their exhibit. 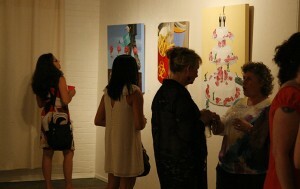 The Times Picayune recently posted an article about the show, featuring one of my paintings- the direct link – www.nola.com. (Though it was too late to correct this for the papers, my work was featured on MTV’s Real World: Hollywood, not New Orleans.) Opening night will be this Friday- August 27th from 7-9pm. The exhibit will remain up through September 25th at City Hall. I also found out that the Slidell Commission on the Arts has selected my work to be featured in a solo exhibition in the 2011-2012 cultural season. The exhibit will take place at the Slidell Cultural Center at City Hall. I’ll be sure to post more details closer to time. 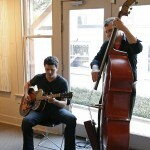 More information regarding shows can be found at www.AmyGuidry.com. You can also sign up for my newsletter on the Contact page of my site. As promised, here is my second post for the day. 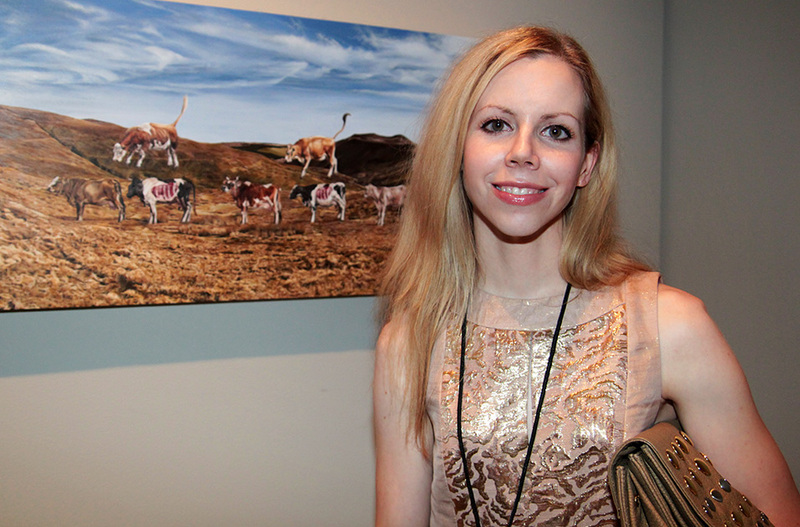 I was recently at the Wally Workman Gallery 30th Anniversary exhibit opening. It was packed, to say the least. Luckily, there were a few moments to get some photos (you pretty much have to wait until the crowd clears and then jump in with the camera). So here are a few photos for those of you that couldn’t make it. 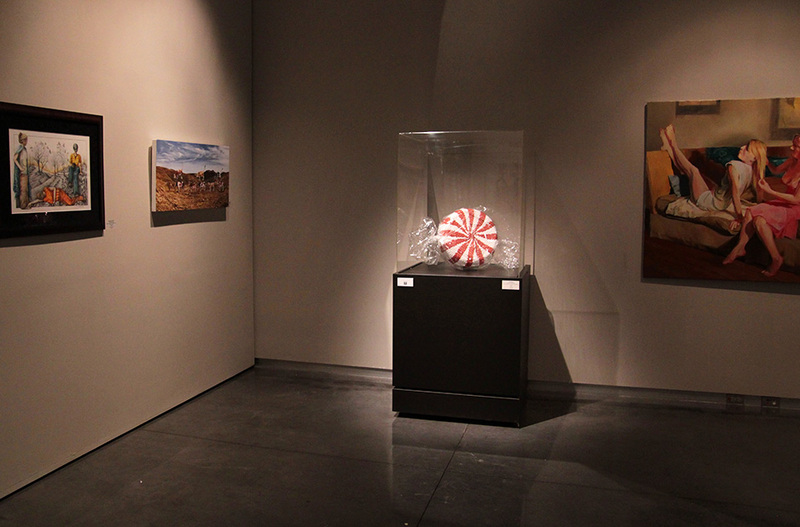 (Though there is still ample time since the exhibit is up through September 4th.) Actually, I would recommend that anyone at the opening come back for a second look. It is very difficult to get a good view of the art when it’s that crowded. One woman told me she felt claustrophobic! All in all, great show and should not be missed. Oh, and for more photos from the 30th Anniversary exhibit, check out Michael Barnes’s post on Austin360.com. I am featured in one of the photos from the opening- here is the direct link- www.Austin360.com. And to view more of my work, visit www.AmyGuidry.com. I have two shows coming up, well, one is this weekend (!!) and the other will be next month. I was delighted to know that my work was selected for The Black Plague exhibit at The Congregation Gallery in Los Angeles, CA. 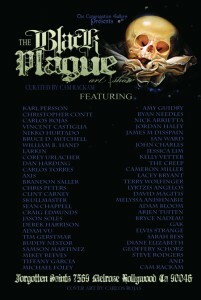 There is a rather impressive line-up of artists including Chris Peters, Buddy Nestor, and Karl Persson. 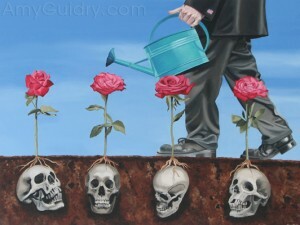 The show opens this Saturday, July 24th at The Congregation Gallery from 9-12pm. Next month’s show will be at the Alexandria Museum of Art. I submitted for their 23rd September Competition and just received the good news yesterday. The juror for this year’s event is Kelli Scott Kelley. Ms. Kelley is an accomplished artist (I’m a fan of hers, so I really wanted to enter this show!) and a professor at LSU, Louisiana State University. 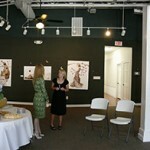 There will be an opening reception and juror’s talk on August 27th from 6:30-8:30pm. The exhibit will be up through October 2nd. If you would like a full list of my current and upcoming events as well as new work, be sure to sign up for my newsletter. The newsletter is sent monthly and I can promise that your email will not be shared with anyone (so you won’t receive any spam!). 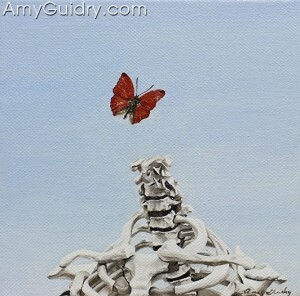 You can sign up on the contact page of my website- www.amyguidry.com/contact.html or send me an email. I received news the other day that my work was selected for this year’s Art Melt in Baton Rouge. So looks like my new work is going to get some more exposure! 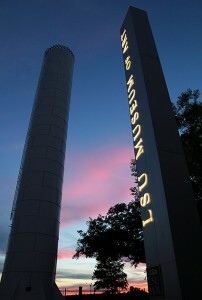 The 2010 Art Melt will be held at a new venue this year- the Louisiana State Museum in Baton Rouge, LA. The jurors for this year’s exhibit were Andrea Pollan, the Executive Director of the Curator’s Office in Washington D.C; Denny Mecham, the Executive Director of the Ohr-O’Keefe Museum of Art in Biloxi, Mississippi; and Paul Dean, Associate Professor at the LSU School of Art in Baton Rouge, LA. The exhibit will open July 16th and remain up through August 28th. There will be a preview party on July 15th from 6:30-10pm. For more information, check out their website at www.ArtMelt.org. And for more information on my work and to view my portfolio, visit www.AmyGuidry.com. 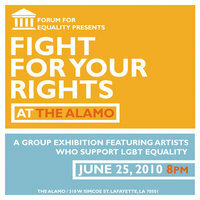 Where you need to be: The Alamo (downtown Lafayette); When: Friday, June 25; Time: 8-11:30pm. See you there! 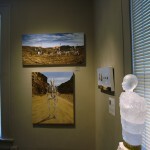 Here’s a taste of my event photos from my show at the Schepis Museum in Columbia, LA. More on my events section of my website www.AmyGuidry.com. The show is a solo exhibit of my “New Realm” series and is up now through the end of June, so be sure to stop by if you are in the area. The News Star, the Monroe local newspaper, also ran a short article about the show. 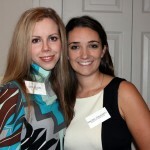 Read the article online at http://www.thenewsstar.com/article/20100528/LIFESTYLE/5280303.